A healthy tan can improve anyone’s look, but nowadays we all know the dangers of laying in the sun too long, or using a tanning booth. But many sunscreens will actively prevent us from tanning. So what do we do? Be forever worried about getting cancer for beauty? Or use our sunscreen and feel ugly and pasty all Summer long? Well, a third and simple option is to swap out your regular sun tan lotion for a darkening tanning lotion, which will add brown without harming your skin. This tanning lotion is designed to give you the best possible results, whoever you are. It acts quickly, leaving a great tan. 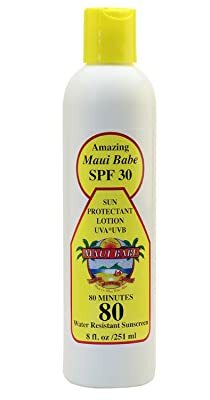 It is also shower-proof and safe to use with tattoos, so you won’t end up with a streaky, patchy tan, weird tanlines, or faded tats when you get home. It is a rich moisturizer too, leaving your skin silky soft to touch. However it does not offer UVA/UVB protection as standard, so use it to speed up a tan, not to lie in the sun all day. It is also scented, which some may like and some may not. It’s a little known secret that the beta carotenes in carrots, red peppers, or papayas, will add richness and glow to your natural tan without making you orange. This tanning oil uses extracts from carrots and bananas for a colour and moisture boost. However it has no SPF, so only use it to speed up a tan, not for a day on the beach. If you have very sensitive skin, consider using the one with minor SPF8, to protect you a little more. Coconut oil is a powerfully hydrating base, but if you want maximum tan and maximum hydration, consider going for pure MCT. This oil is nothing but MCT extracted from coconuts. This means it is totally natural. It helps you tan beautifully whilst hydrating and nourishing your skin. It does not offer any SPF, so make sure to use it for short bursts. It can also be used to strengthen your hair and protect it from drying out in the sun. Ed Hardy make some amazing products and this is among their best. It is enriched with coconut milk on top of the oil, for extra soft skin. It also stimulates extra melanin formation, rather than use surface brozing agents, giving you a more natural tan. And as it deeply hydrates your skin it will firm you up and help prevent cellulite and wrinkles. It does have a strong smell, and it does not offer UV protection. Not all tanners can, or should, be used on tanning beds. This is because some react strongly to the extra heat of the lamps, whereas others drip, posing a potential risk. This one is specially formulated for tanning beds. It is also loaded with hydrating agents and vitamins, to ensure it delivers silky soft skin on top of a great tan. You can use it outdoors if you like too, but it does not offer UV protection. For advanced tanners, the previous entry may not be enough. This lotion is much more powerful, offering fifteen times the darkness offered by their usual products. It is also a good moisturizer with a delicious berry scent. But it does not offer any SPF. Some tanning lotions are far more effective for lighter skin than for dark skins. 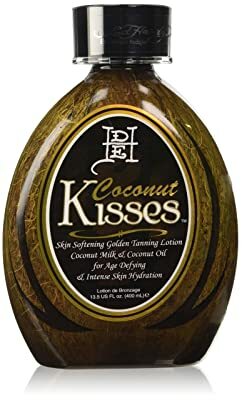 If you have naturally dark skin and want something to add a bit of richness, but nothing works, this product could be good for you. Likewise, if you are very pale and other lotions leave you dirty looking rather than tan, this may work for you. It’s not a browner, but a self-adjusting tanning lotion for all skins. It is also totally oil free, for a safer tanning experience. For a streak-free, easy to apply solution, a spray may be right for you. 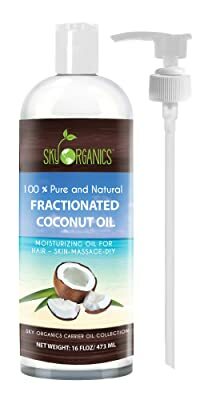 This oil is non-greasy and mists nicely, needing minimal rubbing. It moisturizes deeply and will help you get a richer, more natural tan. It is completely waterproof too, so you should get a good run out of it. However it offers no UV protection. This browning lotion speeds up your tan wonderfully, no matter what your skin tone. 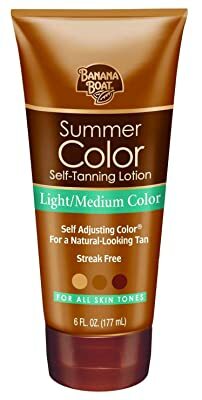 Not many tanning lotions work the same on all skin shades, so this is great. It is safe for sensitive and fair skin as well. However some people find it is too oily for many people who are sensitive to textures. This doesn’t affect how well it works. If you want to really bake, but your skin is very sensitive, consider using this sunblock. It can be used alongside any brozing lotion, so you will get the rich tan you need without suffering the UV rays. 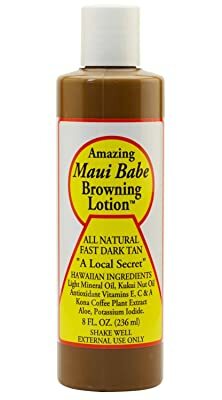 This product will not tan you, but it will protect you as you tan using a regular browning lotion. The best lotion to use it with is their own brand. 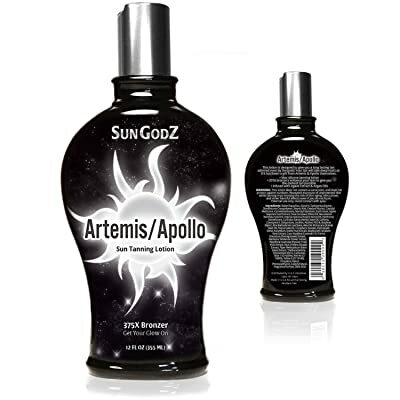 When buying a tanning lotion, you need to be aware that there are two distinct types. There are the pro-tanning SPF lotions, which give you a lot of protection from UVA and UVB rays. These ones add some tanning factors to the standard suntan lotion, letting you brown with minimal harm. And there are the non-SPF ones. These ones offer no protection, but speed up the tanning process so that you need to spend less time in the sun. When used correctly, both are better for your health than tanning without any lotion at all, and both can deliver a strong tan. You also need to consider whether you are a tanning beginner, already quite tan, or already melanin-rich, and how dark you want to go. Some tanning lotions are not as good when you have already tanned a little. Some are not great for dark skin, and others do not work as well for light skin. Make sure to check out products recommended by and for people with your particular skin tone. Finally, consider the sensitivity of your skin and ask yourself if a browner-friendly sunblock may be needed. No matter the shade of your skin, if you do not normally tan easily, and you burn fast, a tanning lotion may not help. This is because even half an hour in the sun, with a lotion on, can burn you. And whenever you burn you will be at increased risk of skin cancer. If your skin is naturally dry or oily you may burn worse too. In these cases, get a tanning lotion with SPF, or a sunblock to use with your browner. Banana Boat Deep Tanning Oil Spray with Carrot and Banana Extracts has got to be my favourite tanning lotion. It is not too greasy, safe for sensitive skin, and works on all tones. And the carrot extract adds a little richness, not just darkness, to your skin. Finally, the option of buying the SPF8 option if your skin is a little more delicate is a very good thing.